Lukwe means ‘a place of natural beauty’ and is perched on the side of an idyllic valley, where the Manchewe and Kazichi Falls plunge 80 metres below into a deep and untamed gorge. The view from the deck at the main lodge, where meals are served and dreams are dreamt, crosses a valley with Nyika plateau in the back drop, leads you to Lake Malawi and takes you across the great expanse of water, into Tanzania and the Kipengere mountain range. 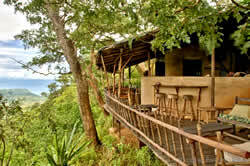 Lukwe offers tranquil lodging and camping on 5 hectares of Brachystygia and Miombo woodland. View from the deck at Lukwe EcoCamp. Unusual architecture welcomes you at Lukwe complemented by handcrafted wood and functional sculpture. 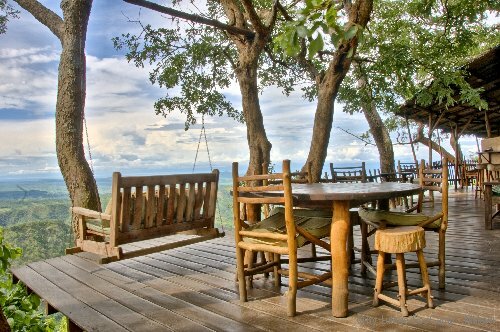 Meals are served under the stars or near a crackling fire in the colder months, when the clouds roll up the valley. The lodge is solar powered and wood fuelled. Drinks are cooled by the sun and we serve home baked bread and meals from our wood burning stoves. 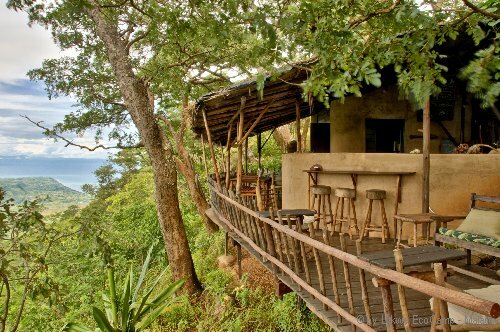 Bar and Resturant at Lukwe EcoCamp. Rest weary legs after a hard day hiking on the multitude of trails to nearby Chombe Plateau , Manchewe Falls, Historic Livingstonia Mission , Smallholder Coffee Farmers or choose just to meander about, greeting farmers and their families along the way as they go about their daily lives. 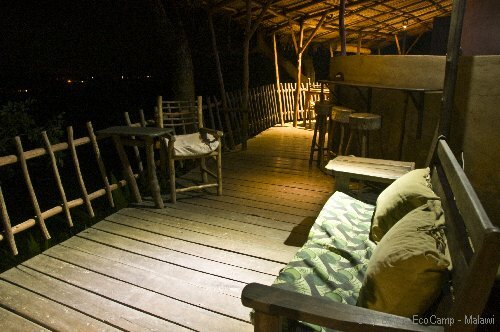 The deck at night at Lukwe EcoCamp Malawi. Lukwe truly is an ecological tourism site in Northern Malawi. The concept of integrating tourism, sustainable living, free range food and community service at Lukwe goes back to 1996, when Lieza and friends first set up camp in the bush at Lukwe. Auke joined a few years later and his remarkable skills and love for nature has complemented all that Lukwe is. A wealth of information and inspiration is available to visitors at Lukwe.